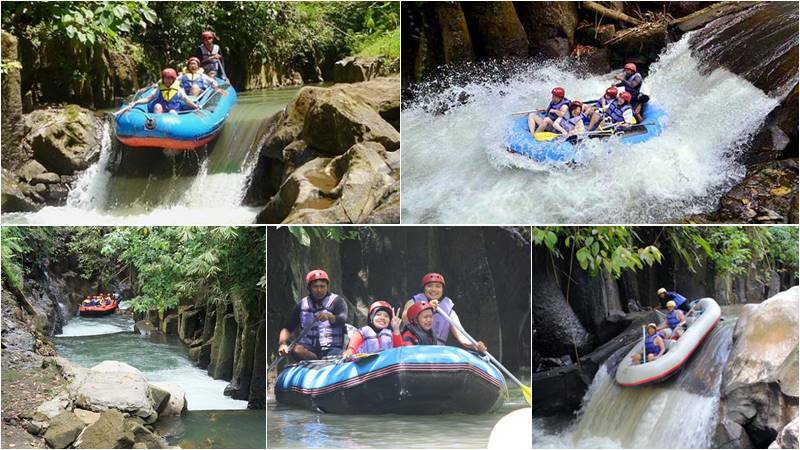 Melangit River Rafting is one of Bali rafting located in the village of Bakas, Klungkung. This rafting site is only one hour’s drive from Bali International Airport. For those who have done rafting on the Telaga Waja river or Ayung river in Bali, Melangit river is your last option for rafting on your Bali adventure. Melangit river is located in the subvillage of Kawan, Bakas Village, Banjarangkan District, Klungkung Regency. There are over thirty rapids with a height of 1 to 4 meters. The turning river is sharp, current is fast and the impact of the river walls is challenging and makes the adventure with an 8 km journey more exciting. The adventure will certainly alleviate your stress and make you refreshed. Given many challenging rapids and a wonderful view of the river, you will feel that the adventure is too short. It only takes 5 minutes to walk from the car park to the river, and the adventure rafting takes 90 to 120 minutes including break time. You only need 7 minutes to walk from the finishing point to the parking lot in a relative level land. You’ll then have a shower, changes and lunch. 08.00-08.30 : Guests will be pick up from hotel and transfer to Bakas Village. 09.30-09.45 : Guests arrive at the starting point for Melangit river rafting. Guests register by completing the registration and insurance form. Change your clothes for the trip, all valuable things are keeping in our car, except for personal items such as money and camera (waterproof bag are provided). Guests wear life jacket and helmet, a paddle is given to each guest. Our rafting guide will lead guests to the river side. 09.50-09.55 : The Guide briefs the guest and shows the safety standard and all instructions for the journey. Please listen to the briefings and ask our guide for a question. 10.00-10.15 : The rafting adventure begins with a 2-hour journey along the paradise river. 12.00-12.15 : Guests come to the finishing point, take towel, shower and change. 13.15-13.30 : Ready to return to your hotel. Pick up at: Tanah Lot, Candidasa, Amed, Tulamben, Lovina can be arranged subject on the term & conditions. Because we are the whole seller with very strong networks, then we can provide the most competitive rate with qualifed rafting equipments. Feel more convenience during your transfer, because no other person join in our car/van. Free Stop If you want make any Photograp on our transfer to rafting location. After rafting Done, you may stay longer at Our restaurant for enjoy your lunch & view or you may back earlier as you please. As We offers Best Seller Package, After Rafting Done if you want combine with our Best Seller Package also can be arranged. If you want to be droped to others Famous Tourist Spot like Ubud Center, Seminyak, Sanur, Denpasar, Kuta Center or Kuta Beach, can be arrange without any Extra Charge.